Chepelare mountain and ski resort in Rodope mountain, Bulgaria. 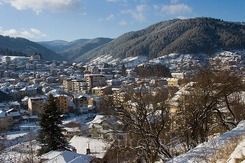 Rhodope, rodopi, skiing and snowboarding. Chepelare occupies a small valley at the heart of the Rodoppi Mountain. The beautiful Chepelare River passes through the pretty town. Chepelare is 222 kilometers away from Sofia and just 72 kilometers sought of Plovdiv. The Pamporovo resort is just 10 kilometers away. Chepelare is a beautiful mountain town and the nature that surrounds it – venerable fir trees, mountain springs green meadows (in the spring) and deep snow slopes in the winter makes it a place for complete and thorough relax. Chepelare Ski Centre: Sport centre Chepelare welcomes tourists with 20 km ski slopes and ski roads. All slopes are maintained and marked according to the European standards. One of the major slopes in the resort is 3250 m “red”. It is equipped with the most modern system for artificial snow in Bulgaria. The slopes can be covered with snow in just 100 hours with maximum temperatures of -3°C. Skiers can enjoy a 6 km long “Green“slope, as well as several shorter slopes of different difficulty. Expert skiers can enjoy 1,2 km long “red” difficult slope. All ski slopes offer free wireless Internet on the slopes. Also nearby is a 5 kilometer biathlon track. A tourist would never feel bored because the resort also offers parallel slalom for skiers; ski competitions - Chepelare Cup, Orion Cup and others; ski schools; sledding competitions; outdoor winter carnivals. The Wonderful Bridges are situated in the central Rodopi Mountains along the east slopes of the Chernatitsa hill on 1450 meters above the sea level. They are located 80 kilometers south of Plovdiv, 35 kilometers north-west of Chepelare, and only 5 kilometers north-west of the village of Zabardo. There are two bridges. The bigger one is 96 metres long and 70 metres wide. The arc rises about 45 metres above the clear waters of the river. The marble block of the bridge is 12-15 metres wide and an eco route passes on it. There are two caves in the walls of the bridge which are home of many bats and birds. The second bridge is about 200 metres downstream of the river. It is 60 metres long and 50 metres high. It is like a narrow tunnel which turns into a small cleft in its end. It is very interesting that the river disappears in the tunnel and rises again 1.5 km further. Bachkovo Monastery - The “Assumption” monastery is the second large monastery in Bulgaria. It is situated in the western part of Rodope Mountain 10 km away from Asenovgrad. It was founded by Grigoriy Bukuriani – Georgian military commander who was at the service of the Byzantine Emperor. The wall paintings in the refectory date back from 1643 and they are of great art value. There are stages of “the Doomsday”, figures of holly monks, stages from the Orthodox Church history and many other mural paintings. The icon of Virgin Mary is very attractive too. It is said that the icon is miraculous. 103 manuscripts and 252 old printed books were found in the monastery in the beginning of 20 century and were called “a real literature depository”. Observatory "Rozhen", under the Institute for Astronomy and BAN, is located on a ridge amidst a conifer forest 6 km from "Rozhen" and 15 km from Pamporovo resort. It is at an elevation of 1750 m above sea - level. The Observatory is still the largest observatory complex for optical astro - physics in South - Eastern Europe. It is equipped with 4 telescopes. Visits to the observatory are possible after 2 pm. St. Atanas Church - St. Antanas Church was built in 1834 in the impressive time of a little less than two months. It was built and paid for exclusively by local residents and to this day remains and point of civic pride. In 1841 it started educating youth in a building near the church and effectively became the first official school in the central Rhodopi Mountains. Ski Museum - The Ski Museum of Chepelare was opened on May 8th 1998 as a result of Ekateria Dafovska’s gold medal win in the 1998 Nagano Winter Olympics. She became world champion in the sport of biathlon and trained and was born here in Chepelare. The museum documents the evolution of winter sports and skiing in the area along with the hard work and efforts of those individuals that contributed to its development. The museum contains over 700 different exhibits that display the rich history of winter sports in the region. The museum is open from Tuesday to Saturday from 9:00 am to 12:00 pm and after lunch from 1:00 pm to 5:00 pm. Cave Museum - The Cave Museum was opened in January of 1980 by a local man named Dimitar Raichev and is the only one of its kind in the Balkan peninsula . It was created with help of the local speleological club whose main goal was to create tourist paths in the nearby Yagodinska and Devil’s Throat caves. The museum documents caves and geological cave formations from the dawn of time. The museum offers around 9400 exponents and topics as cave geology, mineralogy, cave archaeology and animal life. There is a lecture hall with 60 seats, a laboratory and a library with 730 different science books. The museum is open from Tuesday to Saturday from 9:00 am to 12:00 pm and after lunch 1:00 pm to 5:00 pm. House of Culture - The house of culture, Rhodpska Iskra, was first founded as an organization in January of 1880 by Dimitar Mitov and 60 active citizens from Chepelare. The building was then constructed during a 15 year period from 1897 to 1912 making it the first house of culture to be built in the Rhodopi region. Today it is a centrepiece of the town and includes a library, a large central hall with 430 seats and a smaller secondary one with 20 seats. Local groups periodically put on plays, musical and dance performances here. 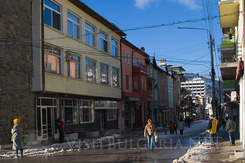 Many small privately owned hotels are available in Chepelare. During the winter the resort and the hotels are quite busy and a booking is required. Most of the hotels are 2 or 3 stars and you can see some of them in the left table of this page. Most of the hotels have restaurants where guests can order breakfast or dinner. Ski rentals are available at the hotels too.